DARE COUNTY — As the need for dredging in North Carolina waterways has long ago surpassed the availability of funds and equipment to dredge, Dare County, with the help of $15 million provided in the recent state budget, is about to try something different: Build a dedicated dredge to maintain its waterways. The plan would be a private-public partnership where a forgivable loan would be offered to the owner/operator in exchange for discounts on the dredging work. 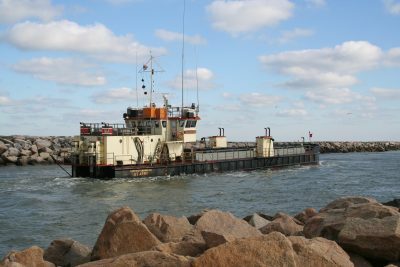 The ocean-certified dredge would mostly be used to maintain Oregon Inlet – a notoriously high-need waterway – and Hatteras Inlet in Dare County. Two responses to the county’s requests for proposals, or RFPs, were submitted before the July 30 deadline to the designated local partner, Dare County, and a private contractor is expected to be chosen this month. 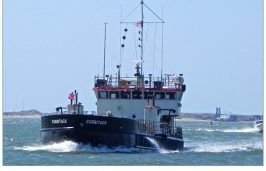 A provision in North Carolina Senate Bill 99, added by state Sen. Bill Cook, R-Beaufort, appropriated the $15 million from the state Shallow Draft Navigation Channel Dredging and Aquatic Weed Fund for Dare to contract with a private developer to design build, operate, maintain and own an ocean-certified hopper dredge. The contractor would have 10 years, with a possible five-year extension, to pay off the loan with credits earned by providing discounted rates for dredging Dare County waterways. Language in the legislation cited the decline in federal funds for decreased maintenance by the Army Corps of Engineers. The proposed hopper dredge, estimated to cost $25 million to $30 million and take about two years to build, would service Oregon Inlet, Hatteras Inlet and their surrounding waterways, and when possible, other waterways and shallow-draft inlets in North Carolina. Hopper dredges hold the dredged material, or spoils, and then deposit it at specific locations. They are capable of withstanding ocean conditions. The state defines shallow-draft navigation channels as inlets with a maximum depth of 16 feet, a river entrance to the Atlantic or other interior coastal waterways, including: the Atlantic Intracoastal Waterway and its side channels, Beaufort Harbor, Bogue Inlet, Carolina Beach Inlet, Back Sound to Lookout Back channel, Lockwood Folly River, Oregon Inlet/Shallowbag Bay, Masonboro Inlet, New River, New Topsail Inlet, Rodanthe Harbor, Hatteras Inlet, Shallotte River, Silver Lake Harbor and the connecting waterway between Pamlico Sound and Beaufort Harbor. At its June 4 board of commissioners meeting, Dare County delegated “any and all delegable duties” to the Oregon Inlet Task Force, an advisory panel established by the commissioners in 2013 to oversee Oregon Inlet maintenance and navigational issues. Cook said that it made sense for the state to first target Oregon Inlet for dredging because of its disproportionate need for annual maintenance. Of the 3 million cubic yards dredged annually in all the state’s shallow-draft inlets, he said about 1.5 million is from Oregon Inlet, which connects Pamlico Sound to the Atlantic between Nags Head and Hatteras Island. According to dredge data from the 2016 North Carolina Beach and Inlet Management report, Oregon Inlet/Shallowbag Bay has been dredged 223 times since 1975, with a total of more than 45 million cubic yards removed. In comparison, Carolina Beach has been dredged 153 times since 1982, with 7 million cubic yards removed, and Morehead City Harbor – a deep-draft waterway – has been dredged 46 times since 1975, with about 47 million cubic yards removed. Cook explained that his relationship with the task force goes back to 2013, when the state set up a committee to study acquisition of Oregon Inlet. The task force, he said, represents a broad range of marine industries, many of which provided information to him. “Considering that half of the shallow draft dredging need is one inlet and the local committee for that inlet (Oregon Inlet Task Force) is well organized and has been a trusted resource, we wanted to make sure the local experts had the final say,” Cook wrote. “The economic impact of Oregon Inlet is very significant and far outweighs the costs necessary to keep the inlet passable. A 2014 economic study by engineering firm Moffatt & Nichol calculated that the inlet is associated with 4,348 jobs and generates $548.4 million in economic impact to the state. Frank Rush, town manager for Emerald Isle in Carteret County, said he understands the need in Dare County, but he hoped that the dredge will be available at some future date for his town to utilize. In general, Rush said that communities on the coast are in the same boat, looking for navigation solutions. “I think all of us collectively need to be exploring new strategies to get this done,” he said. With the proposed contract with the private partner, North Carolina would bear no liability for damages or losses associated with the dredge. The task force would work with the county to develop criteria for the dredge and negotiate a memorandum of agreement with the “private partner,” who would contract with the dredge builder. According to the RFP, the dredge would maintain a 17-foot-deep channel in Oregon Inlet, while “maintaining the capacity” to also dredge Hatteras Inlet and other waterways in the state. The private contractor would pay all costs for the dredge, and work with the task force in the scheduling and location of the dredge, with the decisions of the task force prevailing. In designating the task force to coordinate use of the dredge to ensure that projects “are completed in an expeditious and timely manner,” the Dare County Board of Commissioners required monthly reports be submitted to the board. The law also says that annual reports must be provided to the North Carolina Department of Environmental Quality. The base of operations and the home port for the dredge will be in Dare County. Any supplemental dredge projects in the state would be subject to county approval, based on whether county officials believe the dredge has the capacity. Those projects would not qualify for discounted rates, and the fees would not be credited toward repayment of the forgivable loan. Jim Tobin, manager of Pirate’s Cove Marina and owner of its ship’s store, is chairman of the task force and serves as a Dare County commissioner. Tobin also nominated himself for a three-member subcommittee dealing with the dredge issues, along with members Steve House, also a Dare commissioner, and Harry Schiffmann, according to the June 12 task force meeting minutes. Tobin said that the task force expects to make a recommendation for the private contractor to the board at its next meeting. He said he could not discuss the proposals because they included proprietary information. Despite his connection to the Pirate’s Cove Marina in Manteo, which sponsors popular fishing tournaments and has about 200 slips for charter boats that use Oregon Inlet to go offshore and inshore, Tobin, a Republican, said he has not heard any concerns about conflicts of interest. As a task force member for six years, Tobin said he had traveled to Raleigh numerous times to lobby for help for Oregon Inlet and to talk with legislators. Although Tobin said he didn’t ask – or even know ahead of time – about Cook adding the provision for the dredge, he said it’s a great idea because it will allow Oregon Inlet to be properly maintained with much more frequent dredging. Considering that the inlet has a massive volume of sand – 1.2 million to 1.8 million cubic yards – moving in and out of it every year, there has nearly always been an issue with shoaling, especially around the Bonner Bridge navigation channel, and will continue, even with the new bridge. Although another advisory committee, the Dare County Waterways Commission, is charged with oversight of all the county’s waterway issues, Cook, who supports federal authorization of Hatteras Inlet, said no member of that commission has come to Raleigh in recent years seeking assistance. But Steve “Creature” Coulter, a Hatteras charter boat captain and a Waterways Commission member, said that input from the commission had not been sought, nor had the commission been provided with any information. Bob Woodard, chairman of the Dare County Board of Commissioners, said that the board will be good stewards of the project and its waterways.